A parliamentary report of 1777 listed parish workhouses in operation in Alnwick (for up to 32 inmates), Birling (30), and Warkworth (30). 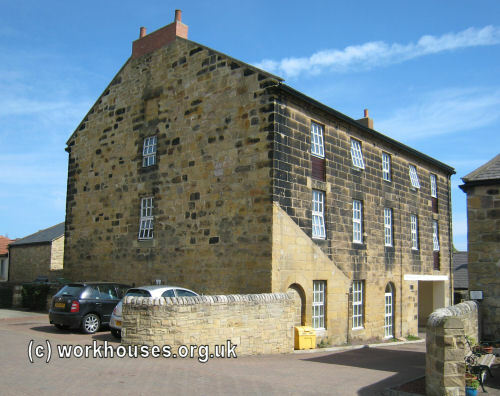 A workhouse opened in Alnwick in 1810 at the north side of Green Batt, between Roxburgh Place and Hotspur Street. It was managed by the parish officers. Of the 34 inmates in the house in 1814, there were twenty whose ages totaled 1523 years, an average of 76 years— a feat which was attributed to the "salubrity of the air of Alnwick". Alnwick Green Batt workhouse site, 1851. Former Alnwick parish workhouse from the west, 2012. Former Alnwick parish workhouse from the south, 2012. What is now Vicarage Cottage at Lesbury was once used as a parish poorhouse. Former Lesbury parish workhouse, 2012. Northumberland: Abberwick, Acklington, Acklington Park, Acton and Old Felton, Alnmouth, Alnwick (7), Amble, Bassington, Beanly, Birling, Bolton, Boulmer and Seaton House, Broompark, Brotherwick, Broxfield, Brunton, Buston High, Buston Low, North Charlton, South Charlton, Craster, Crawley, East and West Ditchburne, Doxford, Dunston, Edlingham, Eglingham, Elyhaugh, Embleton, Falloden, Felton, Glanton, Gloster Hall, Greens and Giantlees, Guizance, Harehope, Hauxley, Hazon and Hartlaw, Hedgley, Howick, Learchild, Lemmington, Lesbury, Longhoughton, Littlehoughton, Morwick, Newton by the Sea, Newton on the Moor, Rennington, Rock, Shawdon, Shilbottle, Shipley, Stamford, Sturton Grange, Swarland, Titlington, Togstone, Walkmill, Warkworth, Whittle, Woodhouse. The population falling within the Union at the 1831 census had been 17,263 with parishes ranging in size from Brotherwick (population 4) to Alnwick itself (6,788). The average annual poor-rate expenditure for the period 1834-6 had been £6,888 or 8s.0d. per head of the population. The main workhouse building was a two-storey T-shaped block facing to the north, with children's playgrounds at its northern side. Males were accommodated at the east of the building and females at the west. The original school room and Master's quarters lay at the centre, with a single-storey dining-hall to the rear, connecting to the washhouse, laundry and kitchen. Alnwick main building from the south-west, 2001. A row of single-storey blocks at the east of the main building contained the original porter's lodge, receiving wards, committee rooms, casual wards and work sheds. Alnwick male vagrants' ward block from the south-east, 2001. The workhouse hospital and mortuary, now demolished, stood at the west of the main workhouse, possibly with a small isolation hospital at its northern side. Further casual wards stood at the south of the hospital. Later additions at the south of the workhouse are believed to have been the Master's house and a new school/children's block. 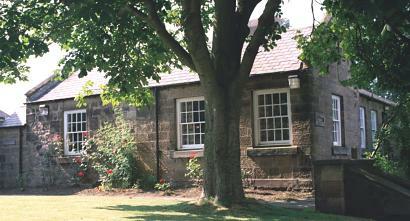 Alnwick Master's house and school/children's block from the north, 2001. A further single-storey building, perhaps a new lodge, was added at the south-east of the workhouse. Alnwick (lodge?) from the east, 2001. Able-bodied male inmates performed stone-breaking, while women were given domestic duties. The later workhouse layout is shown on the 1897 map below. A new 18-bed casual ward was added in 1929. 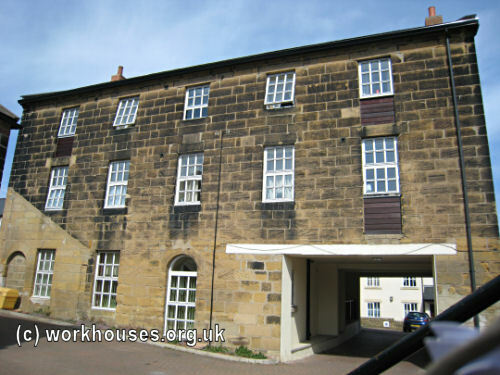 After 1930, the workhouse became Alnwick Public Assistance Institution. During the 1930s, it continued to accommodate chronic sick patients, having 39 beds in 1938. In 1941, the workhouses at Hexham and Ponteland were prepared for the reception of war casualties and their existing inmates transferred to Alnwick. 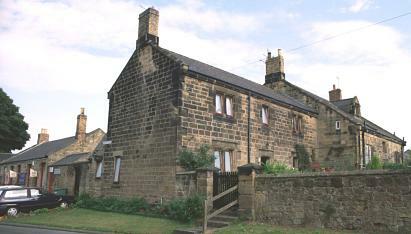 However, Alnwick was closed in June 1943 and its inmates moved out to the Thomas Taylor village homes near Stannington. The former workhouse buildings were later used as an old people's home. The main building has now been converted to office accommodation. Alnwick had a fever hospital at site about a third of a mile to the south of the workhouse, to the north side of what is now Greensfield Avenue. 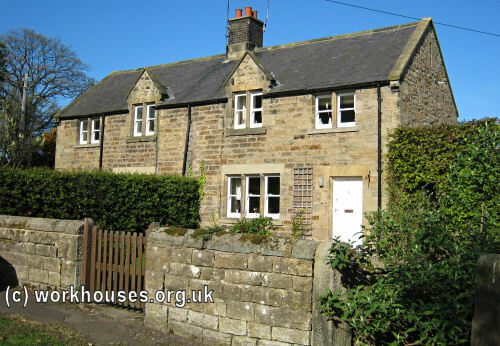 In 1913-14, the Alnwick Union erected children's cottage homes on Wagon Way Road. The property comprised a pair of semi-detached houses, one housing 12 boys, the other 12 girls. The homes were later named Holmlea. Northumberland Collections Service, Woodhorn, Queen Elizabeth II Country Park, Ashington, Northumberland NE63 9YF. Very few records survive — holdings include: Guardians' minutes (1917-30); Bastardy orders register (1852-1916); etc. England's Border Country - A History of Northumberland County Council 1889-1989 by Joan M Taylor (Northumberland County Council, 1989).